When is a Website Fast? Speed Kit accelerates your website – but by how much? Actual Speedup (Speed Kit already active): How much faster is Speed Kit making my website? TL;DR: You can measure page load time with the Page Speed Analyzer or with external tools like WebPagetest or your own browser. Possible Speedup (Speed Kit not active): How much faster will Speed Kit make my website? TL;DR: Have the Page Speed Analyzer generate a performance report for your website to find out! Measuring the Uplift: Why do some performance tests not capture Speed Kit's uplift? TL;DR: Some testing tools do not fully support Service Workers, the technology underneath Speed Kit. Some tools only need proper configuration (e.g. WebPagetest). If you want to read more on web performance in general, check out our in-depth web performance survey. Users find your website rather slow or fast, depending on when the first relevant content is displayed or when they can start interacting with it, e.g. by clicking buttons or filling data into forms. While these aspects of web performance are easy to grasp intuitively, user-perceived page speed is not as easy to measure objectively. As illustrated above, the First Meaningful Paint (FMP) is the moment at which the user gets to see important information for the first time, e.g. headline and text in a blog or search bar and product overview in a webshop. The FMP is typically measured as the moment at which the viewport experiences the greatest visual change. The Speed Index (SI) represents the average time until a visible element appears on-screen. It corresponds to the area above the dashed line in the illustration above — a small SI corresponds to a fast website. The Speed Index or the First Meaningful Paint are hard to measure without specialized tooling. However, there are various other metrics that you can easily measure yourself, with nothing but your web browser. Look at the numbers: At the bottom of the browser window, you can read how long it took until DOMContentLoaded (192 ms) and Load (873 ms), respectively. 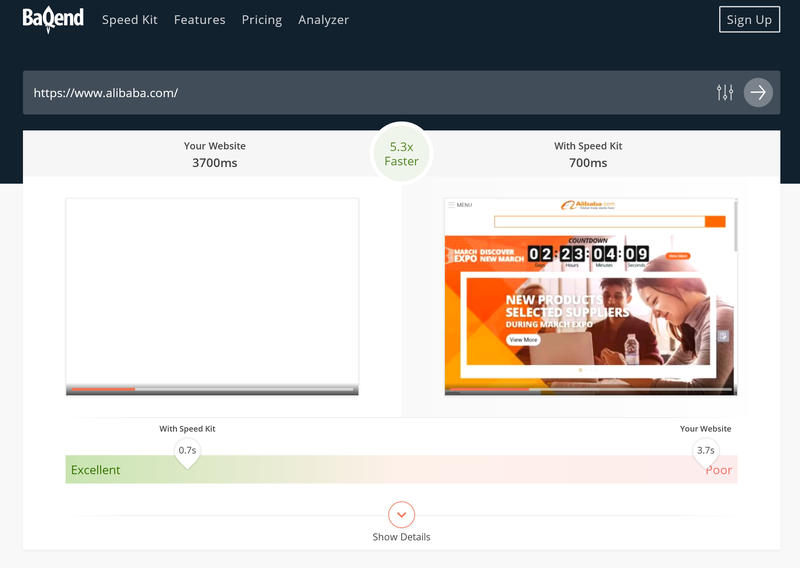 If your website already uses Speed Kit, you can easily verify that it is making things faster. In the following, we describe how to make a quick side-by-side comparison of your website with and without Speed Kit. Disable Speed Kit by checking the "Bypass for network" box; this makes sure that the Speed Kit service worker is not used. Common performance tools like Pingdom or GTmetrix typically do not install Service Workers before taking a performance measurement – or they do not even support them to begin with. Since Speed Kit is built on Service Workers, though, these tools cannot measure any acceleration for good reason: Without its Service Worker, Speed Kit is not active. The Page Speed Analyzer (see below), in contrast, makes sure that Service Workers are installed before the test. Thus, the measurement reflects performance for a user who has already been on your website once before (e.g. visited a specific product page in your shop once last year), but has never visited the page under test. It is important to note, that the analyzer is using cold caches for the performance test. To capture Speed Kit's full performance uplift, a testing tool should first navigate to the homepage (to make sure that Speed Kit is installed and active) before navigating to another subsite to take the actual performance measurement. WebPagetest is a well-known open-source tool for performance analysis. It is also the tool that our own performance test is based on (see below). If Speed Kit is already online on your site, you can use WebPagetest to measure the performance uplift as it is experienced by real users. For the test, go to https://www.webpagetest.org/, open Advanced Settings, and choose the Script tab. Here, you can enter an advanced test script and hit Start Test tun run them. For our purposes, you can paste the following commands for the individual tests. To see Speed Kit's performance uplift, simply compare measurements of both the runs. Performance Report: The analyzer gives you various metrics and even waterfall diagrams for your page load. Optimization Hints: The analyzer provides suggestions on how to improve web performance for your website. User-Centric: The analyzer measures the Speed Index and the First Meaningful Paint (see above). 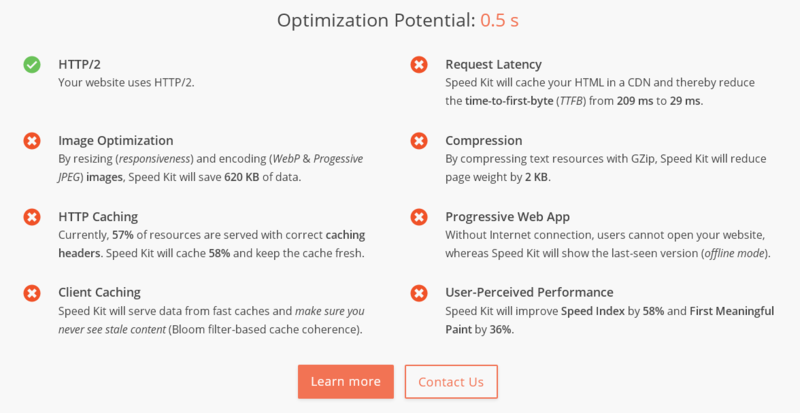 Possible Speedup: The analyzer tells you how much faster your website will be, if you activate Speed Kit. Video Comparison: The analyzer captures the page load, so that you can literally see the effect that Speed Kit has. If Speed Kit is active on your website already, the analyzer deactivates Speed Kit for one of the two tests. If Speed Kit is not active on your website, the analyzer injects Speed Kit into your websites for one of the tests. Thus, you always get to know what Speed Kit currently does or could do for your web performance. Once you enter your website's URL, the analyzer starts two different Chrome browsers to load your website: One loads the version with Speed Kit and the other loads your website without Speed Kit. We did not implement the measurements ourselves, though. Instead, we use the open-source testing framework WebPagetest. You can access the WebPagetest Waterfalls by clicking Show Details below the video comparison and then clicking one of the links at the bottom of the overview (either Without Speed Kit or With Speed Kit, depending on the test run you are interested in). To find out how you can improve your website's page load times, provide the analyzer with your URL and hit enter. It will then execute a performance test against your website and generate both optimization hint and a performance report. The analyzer always compares baseline performance without Speed Kit (left) against the same website accelerated by Speed Kit (right). To this end, the analyzer runs a series of tests against your website without Speed Kit and an accelerated version with Speed Kit (as explained above); finally, the analyzer reports how much of an edge Speed Kit would give you over your current tech stack. Speed Kit will immediately solve all these issues for you: your website is guaranteed to be state of the art. Mobile: Whether or not the website should be loaded from a mobile browser (true) or a desktop browser (false, default). Run from US: Whether or not the website should be loaded from the United States (true) or from Germany (false, default). Activity Timeout: The time after the last network activity before a test is considered complete (see WebPagetest docs). Speed Kit Config: The detailed Config parameters for Speed Kit to allow you performance fine-tuning (see Speed Kit API docs. Speed Index & First Meaningful Paint: Represent how quickly the page rendered the user-visible content (see above). Domains: Number of unique hosts referenced. Resources: Number of HTTP resources loaded. Response Size: Number of compressed response bytes for resources. Time To First Byte (TTFB): Represents the time between connecting to the server and receiving the first content. DOMContentLoaded: Represents the time after which the initial HTML document has been completely loaded and parsed, without waiting for external resources. Last Visual Change: Represents the time after which the final website is visible (no change thereafter).